1) If you would like me to search for your name in the codes, instructions are here. 2) The best Torah codes video to date is here (English subtitles). This web site exists because of a man named Rabbi Michael Dov Weissmandl. He was a hero in the Holocaust, and he was also the forerunner for modern Torah Codes research. Professor Rips was inspired to launch modern codes research more than 40 years ago, due to a book written by the Rabbi's students, called Toras Chemed (Torah of Delight), about the Torah codes that the Rabbi himself found (without computers of course). God, hidden, and very visible to all looking through the lattice. This poem's last four words quote Song of Songs 2:9 from the Bible, which refer to Hashem "peering through the lattice" situated between heaven and earth (so to speak). 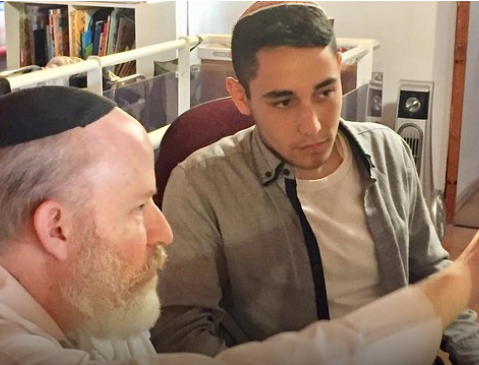 Rabbi Weissmandl's lifelong experience with codes brought all these ideas together, even in the darkest hours of our history. What are codes, after all, if not a way of peering through that lattice? The code below appears to be a stunning affirmation about the Rabbi and his work, which could only have come from above the lattice. Great Rabbis revisited - 20 year puzzle solved here!. This result is so much easier to verify than the original work; yet it reaches the same conclusion. (1) Be sure to check the new Summary section, which says it all (and says it briefly). (2) Two articles down (Sept 25, 2016) a new estimate for this showcase result (Rashi's commentary reflected in codes) is now 1:1M. This extends, and is independent of the original result, which was also at the 1:1M level. Here is another extremely simple and strong result. 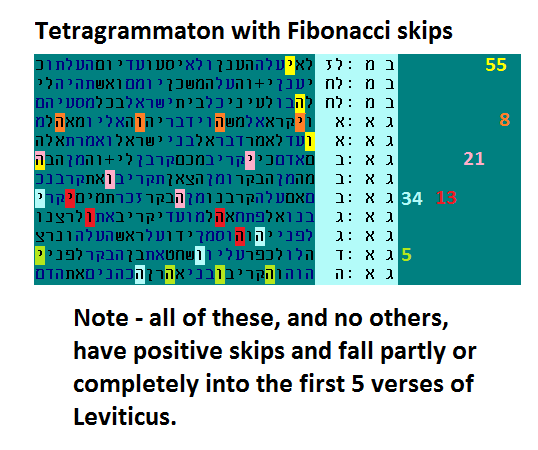 The Tetragrammaton (the Divine Name), occurs 6 times with positive skips under 100, in the first 5 verses of Leviticus. That is not unusual. What is amazing, though, is that the skips for these 6 ELSs are all consecutive numbers in the Fibonacci series: 5 (see green letters below), 8 (orange), 13 (red), 21 (pink), 34 (blue), and 55 (yellow). The Fibonacci series is found throughout nature - in pine cones, sunflowers, shell spirals, etc - check out google images for Fibonacci Series - and it is related to the golden ratio. The chance of something like this happening by coincidence is near 1:20,000. It is almost like 6 numbers being correctly guessed in the UK National Lottery (choosing from 1 to 59) which has odds 1:43M (as explained in this article). In our case though, several non-a-priori aspects are accounted for, listed below in the "P.S." A single word is used, so there is no need to prove semantic connections between multiple words. There is only one spelling of that word. That word is perhaps the most important in the Torah, so there is no need to attempt thousands of other words prior to finding a success. The Fibonacci series is famous and a-priori. The occurrence of the pattern at the very beginning of the book of Leviticus demonstrates that there was no need to search for this pattern in thousands of locations. The accuracy of the underlying text is not in question, as we discuss below. 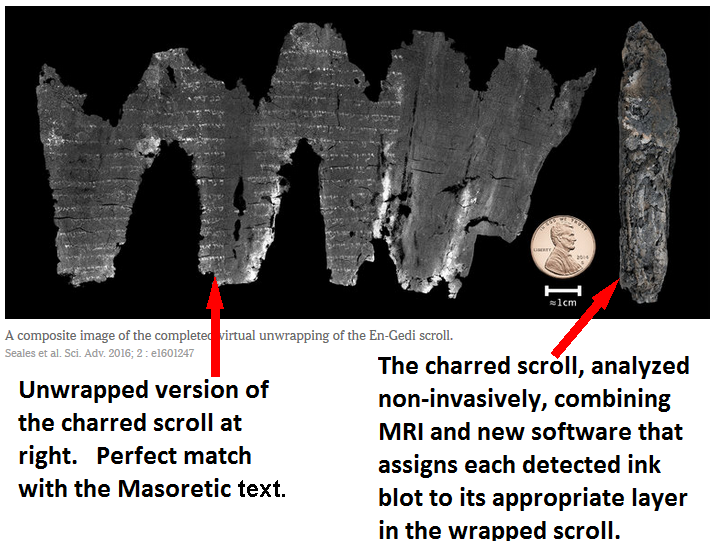 Recently, an ancient, burned scroll containing the beginning verses of Leviticus, between 1800 and 2000 years old, was "virtually unwrapped" and read (see NY Times article). Every one of the 200+ letters that are readable in this scroll match exactly with the Masoretic text of the Torah, which is what we use in Torah Code research. P.S. Any of say 4 patterns could be equally famous and applicable - Fibonacci, square numbers (1, 4, 9, 16, 25, ...), triangular numbers (1, 3, 6, 10, 15, 21, 28, ...), or prime numbers. Any of 5 books of the Torah could have been tried. Any of say 3 words are equally relevant: perhaps "Torah" and 1 other Divine Name besides the Tetragrammaton. Any of say 4 sizes could have been tried (for example, limit the search to 3 verses, or 5, or 10, or 20). Any of say 4 starting numbers in the Fibonacci series could have been tried: 2, 3, 5, 8. Negative skips could have been permitted, which introduces a factor of 2. These factors, 4 * 5 * 3 * 4 * 4 * 2 = 1920, reduce the Lottery significance of 1:43M to something better than 1:20,000. If you are willing to study and reflect on this deeply - I promise that there is yet more light hidden in this new result - in fact (once again) light that is bright enough to show the reality of the entire codes phenomenon. First, and very key, remember that the following table was already part of a stunning five-part series reported in July 2014 (here). As we saw, this example was 'locked in' (via identical patterns) to a (literally) 1-in-a-million class of codes about mountains in Torah. The mountains are un-named, but the commentators (Rashi and others) name them, and the code contains those same hidden names. Now, we take another look at the same 'target' (the above Deuteronomy verse), examining further comments by Rashi. If you've been around this web site, you know that a rare and repeating event is statistically extremely unlikely - as unlikely as a repeating airplane hit into the Twin Towers being unintentional. As shown here, the target is hit again and again, as discovered by Ephraim Yakir. These extended Rashi comments are reflected in the code to the extent that 7 of the 9 words that one could search for (excluding connectors and pronouns) are found near the same short passage. The conclusion is that these extended finds exceed the 1:1M significance level on a series that was already 1:1M (this estimate was updated on March 31, 2017). What's more, Rashi, who lived from 1040 to 1105 and whose teachings are still a centerpiece of contemporary Jewish learning, was commenting at the time on a document over 2000 years old (the Torah) and that document apparently "knew" about him from its inception. Finally, the original code comes from the work of Dr. Alex Rotenberg, who did extensive research on Rashi and codes here. 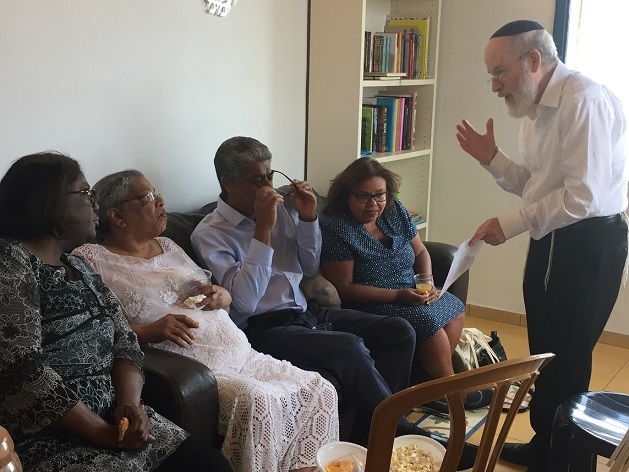 When one is first exposed to Dr. Rotenberg's results, it is difficult to guage how many commentaries by Rashi were used and how many were bypassed, since Rashi was so prolific. However, we have just seen that the extended comments for this showcase example are found as additional codes in the same place. So the above very good question is superceded by an even better answer - the double targeting (repetition) succeeds again, and we are enlightened as to the codes' reality once again. [ Update on July 24, 2016: several valid words that appeared in the future tense have been removed in accordance with my policy of taking great care not to over-state unproven results ]. This is a new kind of code for this web site. Most of the words are not a-priori (given in advance) and yet the method itself is systematic and a-priori. Words must be from a standard source such as all Tanach words. Words are not accepted unless they meet a low probability threshold for appearing so close to the axis. Words can not be diagonal. Words must repeat unless they meet an even smaller probability threshold. These are not arbitrary rules; rather they screen out words that could easily appear in many tables in order to focus on a smaller set. That smaller set is likely to be rich in intentionally-placed words. The significance of such a constrained table can be measured in a way similar to the method described in this peer-reviewed paper for measuring long phrases. In that case and in this case, the words are not a-priori but are highly constrained, and it is possible even with the aid of random look-ups in an English-only dictionary (or English Tanach) to estimate the unlikelihood of finding such "fitting" words among these highly constrained words. In this new case, we are interested only in the number of fitting words, rather than estimating the strength of each word's fit. And of course we factor in the number of non-fitting words as well. While much of this is subjective, the result can be tested against the opinions of a large enough review group to make it objective. Early estimates of these measures indicate that the above result is more significant than 1:100. Note that we can not say which words are for sure significant, but we can say that the overall table is significant because it has many more fitting words than expected. I'm going to try to explain some of the most important points about codes in this section, using one of my favorite code series. These codes are about the Scroll of Esther, one of the books of the Old Testament, which tells the story of Purim. The book is exactly 12,111 letters long, and that is the skip that these codes restrict themselves to. This is a dramatic restriction, such that the words being searched typically appear just once or a few times in the entire Torah with that skip. The above code has chances approaching 1:1000 of being there just by chance, easily demonstrated by using a random "dart throwing" approach. It takes almost 1,000 blind dart throws into an area the size of Torah, to result in the two ELS "darts" landing so close together (just based on the text size and number of "darts"). Many of the related codes have even less chance of appearing randomly, i.e. their intentional appearance in the text is virtually certain (they were measured by a similar dart throwing exercise, and/or comparisons to thousands of "monkey texts" where we expect no codes). 1) One must measure a code's likelihood before giving it any serious consideration. Prolific codes, or those proclaiming new "revelations" or future events are best taken with a mountain of salt. 2) Measurements are only valid if the words involved are "a-priori" in some way (known in advance, or repeated strongly in particular ways from previous results). Lacking this requirement usually means that the cited probabilities are off by a million. 3) Unfortunately, few published codes are measured, and of those, few are measured correctly. 4) This series is one of the best demonstrations of the reality of (correctly measured) significant codes. 5) This series is intriguing and awe-inspiring to anyone who becomes familiar with the story of Purim. The Torah was given 3300 years ago but these codes indicate that the Torah's Author knew about the Purim events which would unfold 900 years later. Read here about BDS propaganda, and how such distorted claims and lies have come to be believed. The movement receives support by deviously portraying itself as a champion of universal values, but only those willing to look closely see its destructive aims for what they are. The currrent wave of stabbings and car rammings against citizens of Israel is now an embarassment to some in the BDS movement, while others actually use the BDS lies to justify such violence. In any case, the above code is particularly simple and stong. I discovered it after reading the above article, and after already having seen some moderately strong precedent codes, where "evil" was repeatedly associated with the current terror wave. 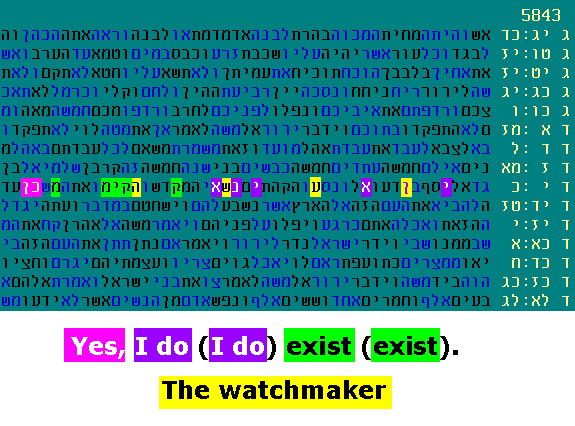 Technical details: Although "evil" is only 2 letters, reish-ayin, the protocol I use is very constricting and applicable to many situations (see for example the word "yes" in the watchmaker codes from June 2015 below). The protocol permits the 2 letters to be either immediately adjacent, or in the case of the 11 less frequently appearing letters (ayin being one of them), the 2 letters can be separated by at most one vertical or horizontal intervening letter. 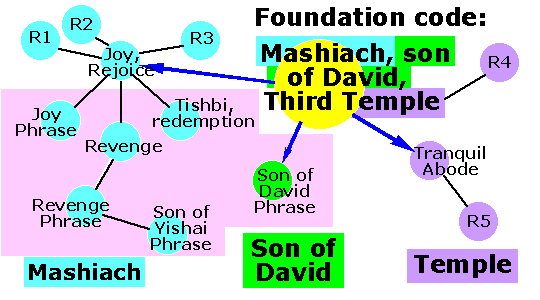 With this protocol, there are 5 such occurrences in the horizontal red-highlighted areas above, which is more than is found in any other short, contiguous (1D) string in Torah. February 25, 2016 - Secrets in the letters. Tzimtzum: I recently learned more about the idea from Kabbalah that G-d contracted himself (called "tzimtzum") when He created the world. Rabbi Noam Elimelech included the idea that G-d actually hid Himself in the letters of the Torah. That is an incredible reinforcement for one of my favorite code series (re-linking here to the result from last October). "Specially marked codes" are now providing a demonstration of intention like we have never seen before. See for example the doubly and triply stacked letters below, in the two July entries. This clustered stacking could be thought of as an insignia - a stamp of authenticity. These concepts are demonstrated, in an even bigger way, by Tim Brooks, here (the latest member of the 1 in a million club - the same link re-emphasized above). After more than 18 years of research I can say that this is a big deal - yet easy to miss if one blinks. It is easy to miss how an already interesting code jumps in significance when it is marked with an insignia, but this is now a very measurable and significant result. Following closely the pattern set below (see Holy land of Israel, July 16), the following code started with a triple appearance of "holy". 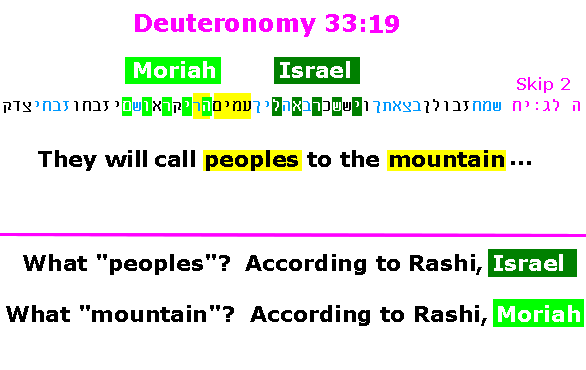 There are a few dozen of these in the Torah with small skip (under 50), but this one had the additional reinforcing pattern of vertically stacked letters - this time triply stacked letters, not just doubly stacked (see yellow highlighted letters). Whereas 0, 1 or 2 such triples are the norm for a table this size, 6 or more is extremely rare. 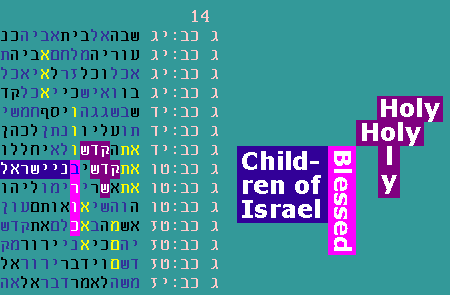 Further, the only relevant vertical 4-letter word in the area is "blessed", which hugs two of the triple letter stacks and meets with the common theme, "children of Israel". So comparing to July 16, we now have 2 common patterns and a common theme, and again significance much higher than 1:1000. In addition to the high significance of this compact arrangement, there is something very unusual going on, a reinforcing phenomenon. I just happened to notice that 20 letters, shaded in yellow, hug the code and each other. These letters are formed by 10 vertical "doubles", i.e. reish above reish, beit above beit, mem above mem, etc. Initial calculations, now confirmed via Monte Carlo runs, indicate that this is by itself significant, at far more than the 1:1000 probability level. Do the codes give some hints about how the universe came to be? There is a "watchmaker" analogy made famous by William Paley in his book "Natural Theology". Paley argued that the complexity of a watch implies a watchmaker, and all the more so, the complexity of the universe implies a Creator. As of this month, we now know about three different codes that refer to this. The vertical and horizontal portions actually appear together in the same table as shown in this combined picture. Now in May/June 2015, further reinforcement comes from the following 2D cluster of the same key words. So the same message occurs independently in three ways - vertically, horizontally, and in an extremely compact cluster. Five occurrences of "yes" in this new cluster added another hint that we are looking at a real message here. These hints became less and less subtle as we ran a series of experiments that studied the extent of repetition of similar key word sets across thousands of monkey texts. The combined result bypasses the 1:10,000 probabliity threshold. This is why I stay away from codes that predict. They can be completely misleading. The following code, appearing in a recent youtube video, is just one example of why. 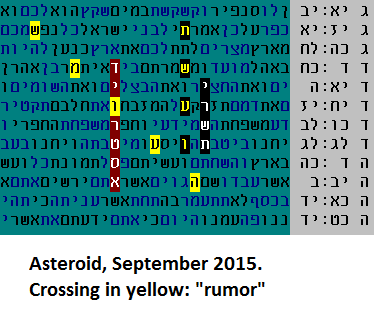 The word "asteroid" (in red), near "September" and "2015" (both in black), seems rather foreboding. Quite often these false predictions have additional problems, such as being clustered so loosely that they are not much different than similar clusters produced from other texts ("monkey texts"). In contrast, the codes highlighted on this site are always subjected to a series of control tests or "hurdles", comparing them to thousands of other texts. In addition, we typically require the key words to strongly repeat in multiple Torah tables, in order to confirm the intention and significance of the original Torah table. There is an interesting new codes documentary now available - info here. Parts of the "watchmaker" series above were actually discovered during/after filming. (Addendum on March 15 - additional George Noory tables here). 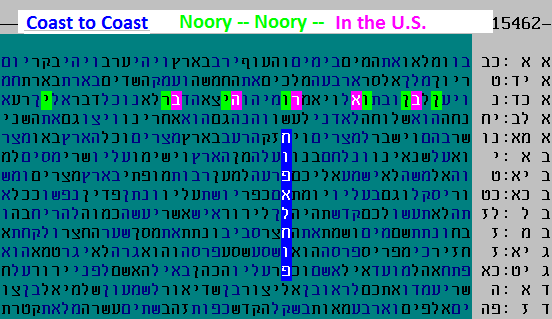 Notice the repetition of "Noory" in the Coast to Coast table, and the other repeated themes among the other Noory tables. These combined repetitions easily exceed the level of 1:1,000. February 2, 2015 - LIGHT! Thanks to Tim Brooks for the following stunning repeats about light. These codes use the same words verbatim from old favorites posted on this site eight years ago! Remember that repeat codes demonstrate a-priori, and that makes literally a world of difference when measuring the significance against monkey texts. The first code above is significant at the level of 1:500 - at least. For the second one, at a glance we know it is significant, because 18 non-overlapping letters, all a-priori, are contained in a box of just 40 letters. In fact, the second one has a result at the level of 1:100,000 (only 7 competitors in 1 million monkey texts). It is such a privilege to just observe this phenomenon. The longer we stay tuned, even from our very limited perspective, the more we see that this form of enlightenment holds wonders within its wonders. The other 4 codes are here. "[the] mountain", is touching the mountain's encoded name, with the same skip (or with skip 1 in one case). The statistical unlikelihood of this set of codes happening merely by chance exceeds 1 in a million (conservative estimate at this point). In summary, this simple code series adds tremendous validition to the whole theory of repetition that we have been exploring for years. March 2014 - part I - "I will be ... your G-d"
The more we walk back through previous doors, the more new doors seem to appear. 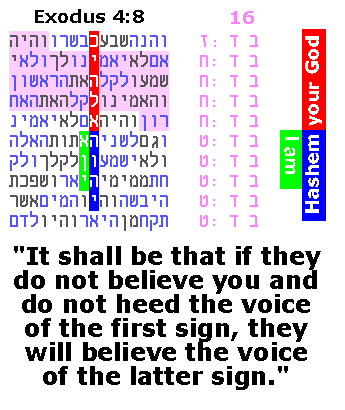 This previous favorite code contains a horizontal configuration at its base, "I will be ... your G-d", as 2 ELSs. 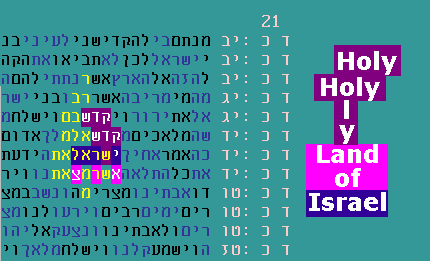 At this very small skip of 23, this 2-word phrase ("I will be"; "your G-d") appears within a string of 5 expressions from the plain text "I am Hashem", 2 of which also indicate "your G-d". 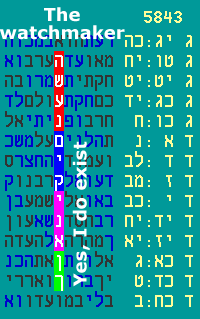 "Your G-d" appears among two clusters containing a total of 9 appearances of "I will be", two of which (bottom right) form the expression in the plain text "I will be as I will be". This is Hashem's answer to Moshe in Exodus 3:14, when Moshe asks "who shall I say sent me", so that the people will know it was really Hashem. The Siddur (prayer book) used in Sephardic synagogues emphasizes three Names of G-d. Two of them, Shem Adnut and the Tetragrammaton ("translated" here as Hashem) are printed throughout the Siddur, either one inside the other, or by weaving their letters together. In the case of special Siddurim that incorporate mystical teachings from the Baal Shem Tov and the Arizal, "Ekieh" ("I will be") is written in columnar format alongside the other two when focusing on the central "Shma" prayer, and when focusing on the wearing of tefillin. So it appears that we are uncovering a growing number of interlocking and inter-validating instances of Hashem's Names which are nothing less than a Network of Signatures. And by the way, Happy Purim! Let's step back from our usual mathematical pursuits and examine the power of repetition - as it applies to the text itself and to codes. The repetition in the plain text of the Torah uncovers deeper meanings and understandings - both for the characters in the Torah and for us as readers. We detail here one example about Yosef's dreams (click on it, it's worth it). We see something similar with Yosef's brother Yehuda, the ancestor of "Mashiach ben David". Yehuda came into his greatness, his leadership, as detailed here. As these examples show, when even a few words are repeated, but those words are very unlikely and very well-targeted, it stops us in our tracks. The Torah itself highlights the importance of repetition. When Yosef interprets Pharaoh's two dreams, he indicates that they are really a repetition of the same thing. Yosef says that G-d repeated the message because He stands ready to carry it out (the seven years of plenty followed by seven years of famine - see Genesis 41:32). "I am Hashem your G-d" is itself a repetition of former codes and was discussed previously here. In conclusion, if we look carefully we can find inspiration in the multiple dimensions of repetition: in codes and in the text; in dreams, in deeds and mis-deeds; and most of all, as a reminder to rectify those mis-deeds. It worked for Yosef, Yehuda and Moshe. May it also work for us. The simplest result from 2013's research is in Figure A (a few pages below), especially repetitions R2 and R3. 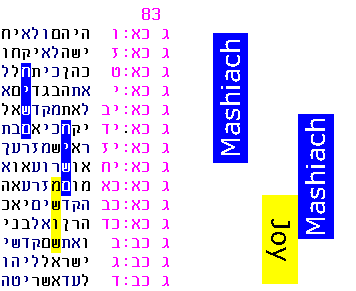 These show the repeated clustering of "Joy" with "Mashiach", and "Rejoice" with "Mashiach". Further repetitions have just come to light. 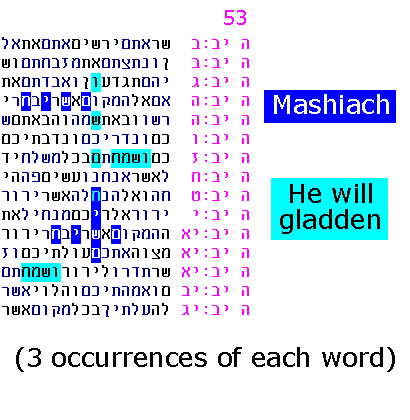 First, the original table containing the overlapping words "Joy" and "Rejoice", contains yet another overlapping word, "he will gladden" (translated as it is used, for example, in the plain text of Deuteronomy 24:5). The highly structured organization and low probability of Figure A below (wherein many individual tables are already at the 1:10,000 level or lower) are themselves significantly strengthened by the above new repeating results. We have come to a crossroads in codes research. Many simple but subtle observations, over years of research and reflection, are beginning to "gel". We are beginning to realize that many of our old favorite "pillar" codes - the highest impact codes with highest relevance - are inter-connected to the same foundation. The effect is dramatic enough so that we believe we are seeing the dawn of "second generation" codes - that is, families of interconnected tables, that "know about each other". Joy is coming. Mashiach will be exalted on high. In My time, the son of David will be exalted. For there is no obstacle to the coming of the son of Yishai. I will dub you “destruction”; cursed is bin Laden and revenge [belongs to] Mashiach. [And the following encoded words connect the series further] - Joy; rejoice; revenge; I will rejoice; He will redeem them; Tishbi [refers to Eliyahu HaNavi who will accompany Mashiach]; the donkey. One code table is found from another by following simple rules that Professor Rips has carefully observed and verified, as follows. Click here, or on the above chart, to see how each code leads to the next. All codes flow from the foundation code (yellow circle), first found in the late 1990's and still one of our favorites. Now that we realize that each of these pillar codes are connected to the same foundation, we understand that there is an unshakable structure which firmly roots the pillars. It may be premature to call these "direct messages" but certainly they provide a "vocabulary of meaning". It is important to note as well, that the above Mashiach phrases have all been rated by teams of Hebrew speakers in previous years and have all ranked near the top when compared with thousands of control phrases gathered from long ELSs found in monkey texts. Much of this work is documented here and here (see January 2009 update near the bottom). 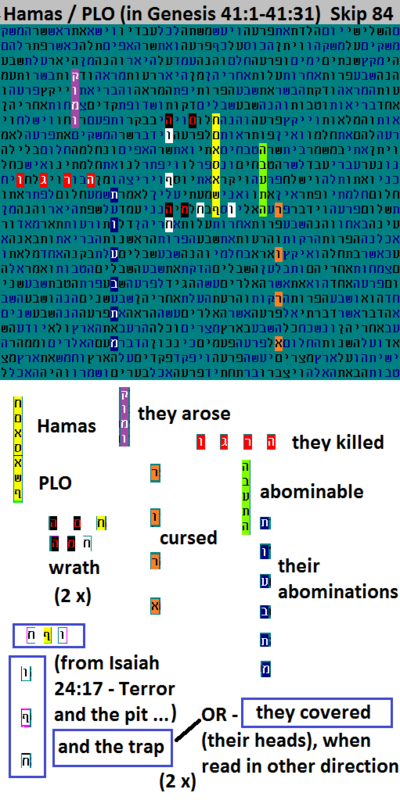 The original search that produced the above result was simply to find the most compact and parallel arrangement for the three key words in red (these are His Names which appear in the plain text of Exodus 6:2-6:3 - which is Hashem's own "commentary" about His Names). Now, four years later, we take a deeper look at the words that immediately appeared back then. 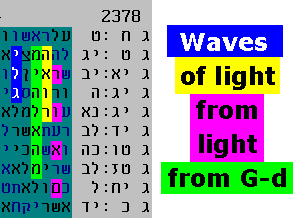 First, we explore the "response" (yellow) indicating "I am" and "your G-d". 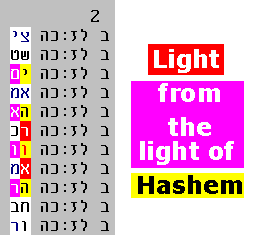 Second, we explore the phenomenon (in blue) of the clustering of "Hashem" (the Tetragrammaton). In both cases, the above pages display repetitions of these elements which are direct, simple, and strong. The number of codes to choose from is limited to the small number of "gems" reported on this site. The repetition involves the same key words. So the first code "dictates" what will appear in the repeat code. The repeat code is therefore a priori (i.e. "pre-announced") in a completely verifiable way. See the topics at the upper left for the newest examples of codes pre-announced by other codes.